The Overture to Johann Strauss’s operetta Die Fledermaus opened the State Theatre’s New Year’s Eve show Salute to Vienna. A festive overture, it majestically builds toward its last movement—a nice opening to an evening of rich music. Die Fledermaus opened in Vienna in 1874. The Viennese are known for their New Year’s concert. The Vienna Philharmonic’s concert is a 75-year old tradition and its 2017 concert was broadcast in over 90 countries. In the tradition of the Vienna concert, the Strauss Symphony of America brought the celebration to the State Theatre and many other venues across the United States. Hungarian Maestro Imre Kollar led the orchestra for the State Theatre’s show. The program was mainly a Strauss one with some works of other composers including Robert Stolz and Franz Lehar. Lehar was Strauss’s Viennese contemporary and Stolz was an early 20th century composer. Strauss was known as the ‘Waltz King’. The backdrop of opulent concert halls added a nice touch, reminding me of the Hapsburg palace museum, and a Mozart concert I attended there. An opulent city, Vienna is one of my favorites. 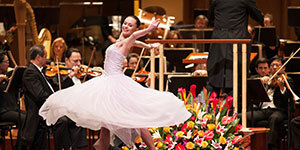 The tour de force included many talented people: The Strauss Orchestra, soprano Katarzyna Dondalska, tenor Zoltan Nyari, The National Ballet of Hungary, and the International Champion Ballroom Dancers. The evening was a sumptuous one led by the talented Maestro Kollar who sprinkled humor throughout the show, including a cell phone call from Strauss who told him to play faster, ensuring him he would be the chief conductor in heaven. For one of the pieces, he played a small instrument that sounded like birdsong; he whistled every so often, gestured to us, and garnered some laughter. The ballroom and ballet dancers were dressed to the nines, as they waltzed around the stage, bringing the Vienna concert halls of the late 1800s to present day. The second part of the show began with the Overture to Gypsy Baron, the first operetta Kollar attended; his violin teacher brought him to the show. The piece was accompanied by Soprano Katarzyna Dondalska. Tenor Zoltan Nyari sang a piece from Franz Lenar’s Land of Smiles, and both singers wowed the audience who showered them with bravo shouts. The dancers were decked out in shimmery outfits in pastels, burgundy, and white dresses in diamondesque accents, all adding to the show’s opulence. The music and their dance moves conveyed the emotions of the waltzes and polkas played throughout the night. The State Theatre gave each female dancer a bouquet of flowers, a nice present to usher in the New Year and its potential. New Year’s Eve classical concerts are beautiful leaps into the next year as the prior one fades away. The show was a beautiful feat combining the talents of many people to bring the hope and promise of the New Year to the State Theatre’s patrons.